The Photosynth team is calling out for synths of the action from the World Cup, the sporting event taking place in South Africa from June 11th to July 11th, featuring 32 teams from around the globe. Of course, the team itself is getting into the spirit with synths of their own. They’ll be covering a range of South African synths in addition to anything football/soccer/fútbol related from around the world. The current showpiece is gafsynth's synth from the Opening Ceremonies, available here for your panning and deep zooming pleasure. You can add your photos to the World Cup line up, too, by tagging them “worldcup” after upload. 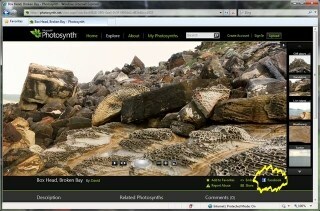 The best synths will be featured on the Photosynth homepage and some will even be featured on Bing worldwide. Nice!